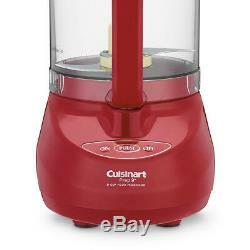 Cuisinart DLC-2009MRY Prep 9 9-Cup Food Processor - Red. Perfecting the art of food preparation. With a glossy red finish that adds a pop of color to any kitchen, the Cuisinart 9-Cup Food Processor is the ideal prep tool for any task. Its compact build allows it to fit comfortably on any countertop and the large work bowl makes it easy to create an entire meal from scratch. After all, it's a Cuisinart! Cuisinart is one of the most trusted names in the kitchen. When it comes to quality, performance, and style, Cuisinart sets the standard with the ultimate food processors that are elegant as they are functional. Turn something as ordinary as pizza dough into a scrumptious savory treat with Cuisinart. Ideal Capacity - Big enough to handle family-sized tasks and compact enough to effectively perform smaller jobs. Kitchen Convenience - Perfect for the busy kitchen. Add large portions including whole vegetables and fruits, through the Supreme Wide-Mouth Feed Tube - no precutting required! The Ultimate Multitasker - Chop, slice, shred, mix, purée and knead with the greatest of ease. Stainless Steel Perfection - The slicing and reversible shredding disc power through food prep with speed and ease, accompanied by the stainless steel blade for maximum efficiency. Heavy Duty Base - Houses 600-watt motor for powerful performance. Touch Pad Controls - Easy to operate On, Off and Pulse. The Pulse button allows you to have full control on how much or little you want food processed. Extra-large feed tube slices whole fruits and vegetables. One-piece Cuisinart Supreme feed tube. Stainless steel medium slicing disc (4mm). All removable parts are dishwasher-safe. 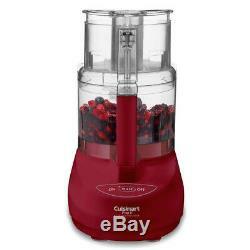 The item "Cuisinart DLC-2009MRY Prep 9 9-Cup Food Processor Red" is in sale since Wednesday, July 4, 2018. This item is in the category "Home & Garden\Kitchen, Dining & Bar\Small Kitchen Appliances\Food Processors".